is what you focus on in the moment, what holds your attention. Most people can only hold about 7 items of information in short-term memory at any given moment (like a phone number). To learn information so that you can retain and recall it, you must transfer it from short-term to long-term MASTERY. is all the information that you know and can recall. In many ways, it becomes a part of you. Once information becomes a part of your long-term MASTERY, you'll have access to it for a long time. There are two ways to move short-term understanding to long-term MASTERY: rote learning and learning through understanding. Rote learning means learning through repetition, which is mechanical and requires little understanding. Learning through understanding involves learning and remembering by understanding the relationships among ideas and information. Both types of learning are useful and often are used together. For example, in multiplication, you memorize facts (like 4x6=24) through rote learning. Then these facts are combined with your concept knowledge of multiplication (repeated addition, arrays) to reach concept understanding. One of the popular theories behind memory loss is the FADING THEORY. According to this theory, the traces or marks that the information etches into your brain is like a path you make in the woods when you continually walk along the same route. If you don't take that same path, it eventually becomes overgrown until it disappears. In the same way, learned facts are forgotten when you don't review them. After 1 day 54% was remembered. After 7 days 35% was remembered. After 14 days 21% was remembered. After 21 days 18% was remembered. After 28 days 19% was remembered. After 63 days 17% was remembered. Without review, most information will be lost from your short-term understanding. The best way to study for a quiz or test is to turn the information from short-term understanding to long-term MASTERY on an ongoing basis. If you wait to review the information until the night before the test (for example 28 days after learning a concept), you will have forgotten 81% of the material and will have to study a lot longer to be sufficiently prepared for the test. In effect, you will only be restoring that information into short-term understanding and not to long-term MASTERY. Review stores information into long-term MASTERY the way a soccer player's abilities are increased not primarily through games (tests) but mainly through practice (review). Our Daily Review turns short-term understanding into long-term MASTERY by combining "rote learning" and "learning through understanding". Students review learned concepts on a daily to weekly basis in a way that requires conceptual understanding and repeated application. Students will know when they need extra coaching through a concept. They won't feel the effects of the fading theory. They will have the confidence when proving their knowledge. And they will gain LONG-TERM MASTERY. Spaced Repetition is a MASTERY technique that incorporates increasing intervals of time between review of previously learned material. Prof. C.A. Mace, in 1932, wrote, "Perhaps the most important discoveries are those which relate to the appropriate distribution of the periods of study…Acts of revision should be spaced in gradually increased intervals--roughly intervals of one day, two days, four days, eight days, and so on." In 1939, H.F. Spitzer tested the effects of spaced repetition on 3600 sixth-grade students and testing showed that it was highly effective. This early work went unnoticed, and the field was relatively quiet until the late 1960's when cognitive psychologists explored manipulation of repetition timing as a means to improve recall, and in 1973 Sebastian Leitner devised his "Leitner system", which was an all-purpose spaced repetition learning system based on flashcards. Spaced Repetition helps learners who must acquire a large number of items and retain them indefinitely into memory. Its main strength organizes review efficiently--focusing more time on the information the learner needs to MASTER and less time on information that the learner has MASTERED. On average, students are taught a new concept every 45 minutes, meaning that students could learn up to 10 new concepts on a school day. How are these new concepts being RETAINED? Our DAILY REVIEW is a great tool for a Spaced Repetition regimen. In 10-15 minutes, not only does it give the teacher a quick guide on which students are not MASTERING a concept, but it allows the students to build confidence in their MASTERY. The teacher can focus on needed concept reinforcement, and the students can enter district and state assessments with a fundamental concept MASTERY that will show what they have been taught. The spiral nature of our DAILY REVIEW and Spaced Repetition are a great supplement to any math program. The saved time and energy are equaled by students' increased MASTERY. Our DAILY REVIEW and Spaced Repetition are a great match! Review is valuable because it increases both learning and retention. 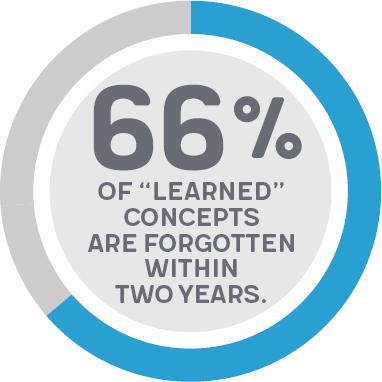 Some evidence indicates that approximately two-thirds of the concepts "learned" in high school and college courses are forgotten within two years. The problem is especially crucial in mathematics, where skills and concepts are taught that cannot be regained simply by rereading. Review cannot be omitted--it is an important component in mathematics instruction. It helps students attain a more comprehensive view of topics covered. It helps summarize main ideas. 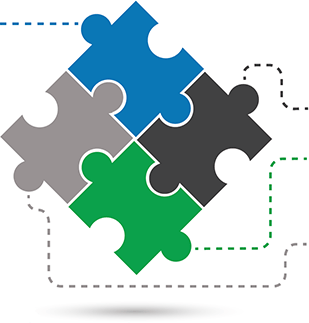 It provides an overall view of what students have been learning piecemeal. It helps students to consolidate what they have learned, enabling them to fit ideas into new patterns. It serves as a diagnostic tool, revealing weaknesses and strengths to students and teachers so reteaching can be planned. It assures that the prerequisites needed for learning new content have been MASTERED and adds to students' confidence in their ability to move successfully to new topics. Research clearly indicates that review should be systematically planned and incorporated into the instructional program. Long-term retention is best served if assignments on a particular skill are spread out in time, rather than concentrated within a short interval. Additionally, research has indicated that short periods of intensive review are better than long periods. "On the whole, both in the laboratory and the classroom, both in adults and in children, and in the cognitive and motor learning domains, spacing leads to better performance than massing"
Spiraling is effective with all learners, including struggling learners. Learning difficulties can be identified when skills and concepts are encountered in the early phases of the spiral and interventions can be implemented when those skills and concepts are encountered again later in the spiral. Why does spacing work better than massing? The theories for the "spacing effect" differ. One possibility is that massing reduces attention so that learning is weaker. Another possibility is that effortful processing of the sort involved in spaced learning enhances long-term retention. Easy learning often doesn't lead to the best retention; more difficult learning can lead to more robust encoding of information and better long-term learning (Schmidt & Bjork, 1992). This explanation identifies the spacing effect as an example of a "desirable difficulty" that enhances learning. A third possibility is that spiraling helps learners make connections over time, which creates more robust pathways for recalling information. Multiple, strategically spaced and strategically progressing learning experiences may produce deeper, more conceptual learning. Why aren't more curricula built with a spiral structure? Most curricula are not designed to take advantage of the spacing effect, much to the frustration of the psychologists who have documented its power (Dempster, 1988; Rohrer, 2009). One reason is that the spacing effect is counterintuitive: People feel that massing leads to higher performance, which is true in the short term--cramming does work for the short term--but is not true if the goal is long-term learning. People confuse short-term performance with long-term learning and inaccurately predict that massed practice will lead to better long-term learning than spaced practice. UCLA psychologist Robert Bjork uses the term "illusion of competence" to describe this feeling (1999). Another reason spiraling is not common in curriculum design is that many teachers are unaware of the benefits of spacing learning over time. Distributed practice is a learning strategy, where practice is broken up into a number of short sessions--over a longer period of time. Humans learn information more effectively when it is studied in several sessions spread out over a long period of time, rather than studied repeatedly in a short period of time. The opposite, massed practice, consists of fewer, longer training sessions, which is generally a less effective method of learning. For example, when studying for an exam dispersing your studying more frequently over a larger period of time will result in more effective learning than intense study the night before. In 1913, influential German psychologist Hermann Ebbinghaus first observed the effect of distributed learning, and published his findings in Memory: A Contribution to Experimental Psychology. An early study that researched the effects of distributed practice was done by Alan Baddeley and Longman in 1978. They researched the effectiveness of distributed practice by teaching postmen how to type using a new system on a typewriter, and comparing massed and spaced learning schedules. They found that although massed practice would seem a more effective learning method because the participants would be able to learn the material in fewer days, the postmen who were taught using shorter sessions stretched over multiple days learned the material better than those who had longer training sessions. Those who learned with DISTRIBUTED LEARNING ended up with more accurate and quicker typing. The role of DISTRIBUTED PRACTICE in the learning of mathematics has also been studied. Marilyn Suydam's 1985 ERIC digest summarized research about the role of review in mathematics instruction. She wrote, "Long-term retention is best served if assignments on a particular skill are spread out in time rather than concentrated within a short interval." Suydam also noted that short periods of intensive review are better than long periods. The relevance of this body of research to the construction of elementary school mathematics curriculum was shown by the translations of Russian textbooks carried out by the University of Chicago School Mathematics Project in the 1980s. The Russian primary grade textbooks were clearly organized to provide spaced rather than massed practice and review. Multiple psychological functions are responsible for the beneficial effects of DISTRIBUTED PRACTICE. The most prevalent of these are procedural learning, priming effects, and expanding retrieval. Procedural Learning is the act of repeating a complex activity over and over again, until all of the relevant neural systems work together to automatically produce the activity. Distributed practice is the most efficient method of procedural learning. By equally distributing the amount of practice of a given activity over a period of time, you will increase the efficiency of learning that skill. Priming is an effect where an initial (often brief) exposure to information influences it subsequent recall or perception. This effect is more notable when dealing with semantic knowledge, but is also applicable to the acquisition of general skills. With regards to DISTRIBUTED PRACTICE, increasing the amount of practice when learning will result in an increased priming effect for subsequent practice sessions. This causes an increase in memory recall, which is equivalent to an increase in learning. This helps explain why distributing your practice sessions, rather than massing them into one session, allows for greater learning. Expanding rehearsal refers to a learning schedule wherein information is initially tested after a short delay, with pre-test delay gradually increasing across subsequent trials. This phenomenon relies on the strength of the consolidated memory in order to efficiently increase success and learning. Memories that were poorly consolidated through inefficient means of practice will be harder to recall, and will reduce the learning achieved through expanding retrieval. Distributed practice directly influences the efficiency of expanding recall, as it provides the strongest basis for memory consolidation, from which to draw needed information. When information is reviewed over a period of time, it benefits from additional contextual associations. Thus, the second occurrence of the information reminds the learner of the first time it was taught and the contextual features surrounding it. When information is distributed, different contextual information is encoded with each presentation, whereas for massed items, the difference in context is relatively small. This leads to more retrieval cues being encoded with spaced than with massed review, leading to improved recall. The more contextual triggers that a student has with a concept, the greater ability the student has for recall and retention. The Study-Phase Retrieval assumes that the first presentation of information is retrieved at the time of the second presentation. This leads to an elaboration of the first memory trace. Massed presentations do not yield advantages because the first trace is active at the time of the second, so it is not retrieved or elaborated on. The central biological constructs involved in any kind of learning are those essential to memory formation, particularly those involved with semantic knowledge: the hippocampus and the surrounding rhinal cortices. Each plays an important role in learning, and therefore in learning techniques such as distributed practice. The hippocampus is central hub of all memory, and the rhinal cortices are as essential to memory and learning as the hippocampus. Distributed Practice is not wholly dependent on either the hippocampus or the rhinal cortices but is dependent on the interaction between working memory abilities and the ability to form long-term memories, whether semantic or episodic, conscious or subconscious. Almost no one masters something new after one or two lessons and one or two homework assignments. That is why one of the most effective strategies for fostering mastery and retention of critical mathematical skills is a daily, cumulative review at the beginning of every lesson. Some teachers call these warm-ups, others call them daily mini-math. It can be delivered orally, written, or displayed on an overhead transparency. But, every day, it is five to eight quick problems to keep skills sharp. Experience with mathematical concepts really does matter. Picture a bumpy grassy field and then picture the same spot being walked over and over enough to make a smooth path making it easier to get from the start to the end. If your brain doesn't have to work as hard on the simple math concepts earlier taught, then there is more memory free to process the teacher's new lesson. "It is working great, I'm thinking of purchasing it for my class next year."